Last week, I had the privilege of talking to Mercer Mayer over the phone. I've loved this man and his art for as long as I can remember, and it was a real thrill to have a chance to speak with him. And wouldn't you know, Mercer was just as animated and interesting as I always imagined him to be. Open and warm, like talking to an old friend. All I could think was his grand kids must have the time of their lives when they are with him. Anywho... Creator of all things Little Critter. Author of the amazing One Monster After Another. Conceiver of my childhood holy grail, Liza Lou and the Yellowbelly Swamp. Not to mention the Boy, Dog and Frog series, There's a Nightmare in My Closet, and countless other stories that have delighted generations of children the world over. His drawing talent is huge and his off-kilter sense of humor definitely helped to mold the cultural connoisseur I am today. So without further gushing, meet Mercer Mayer, perhaps one of the coolest guys in the entire universe. 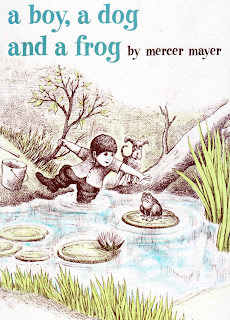 Mercer Mayer was born in 1943 in Little Rock, Arkansas, and from the time he was small, Mercer remembers always drawing. "Monsters, people with their heads chopped off, war, bombs, explosions," he chuckled. His father served in WWII, and as a Navy child they moved a lot, but the bulk of his childhood was spent in Arkansas. "I was a war baby so my influences didn't really come from books or movies. The only book I can remember reading when I was little was Uncle Wiggily and perhaps Peter Pan, that sort of thing. I didn't discover picture books or children's literature until I was older," he remembers. "We lived in a missile base in the middle of nowhere. A housing complex surrounded by swamp land. Most of the stories I wrote were about growing up, about me." Even though he essentially grew up in a suburban fifties neighborhood, it was very much a rural, and all of his stories about swamps and woods and adventure were born there. When he was 13, his family moved to Hawaii, where he eventually attended the Honolulu Academy of Arts and his aspiration to be a children's book artist grew. By 1964, he'd made his way to New York and began studying at the Art Students League and shopping his portfolio around to editors. "When I first started, I went around to see editors like Ursula Nordstrom at Harper and Phyllis Fogelman at Dial Press. Things were more folksy back then when you could just knock on the door and get your work seen." An editor at Dial Press expressed an interest in his drawings, but lamented the fact that they had a hard time finding good stories. "I thought, 'I don't have any good stories'," Mercer recalls. "She said write about your life, and I thought, 'What the heck.'" 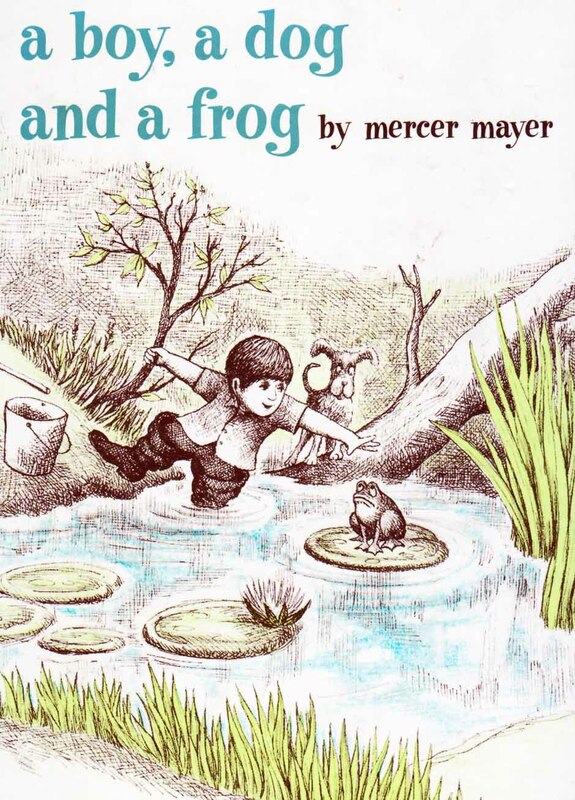 Mercer illustrated several books for other authors while working on his own book. "I started writing, but I've never seen myself as a writer. I began to draw the pictures, and after a while I realized I was telling the story without any words. I went back to the editor at Dial and said, 'I'm sorry there are no words' and she said 'That's great! No words are even better!'" 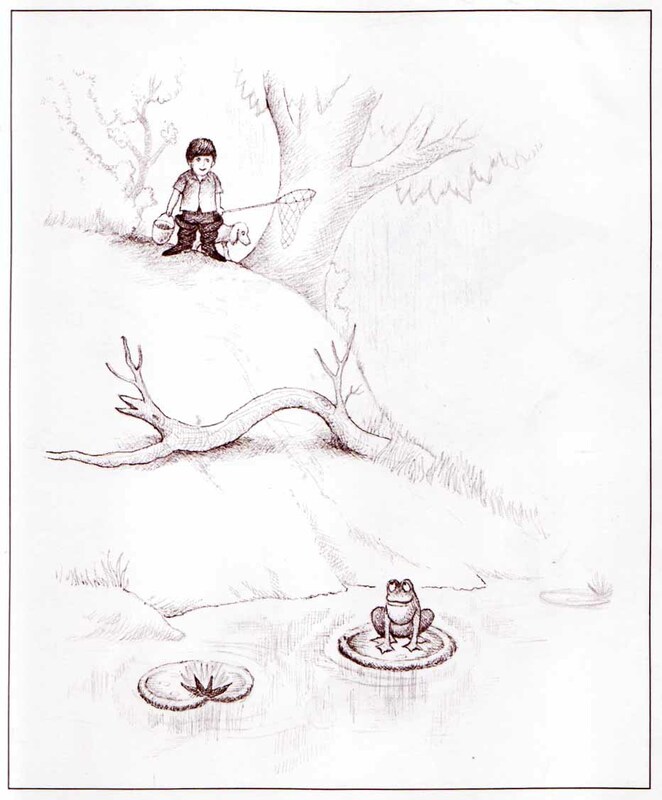 A Boy, a Dog and a Frog was released by Dial in 1967 and has been hailed as being one of the first titles in what would become the genre of wordless picture books. Shortly thereafter, Dial released Mercer's second book, There's a Nightmare in My Closet, again, largely influenced by his own childhood. "All kids have nightmares in their closet. I had a nightmare in my closet until I was an young man!" However, Mercer's monsters where never meant to frighten. "My monsters were never scary, they were really sweet, affectionate monsters. I thought that if you were a child and had a monster in your closet, how would you deal with it. Kids loves monsters and strange things. I love strange things." 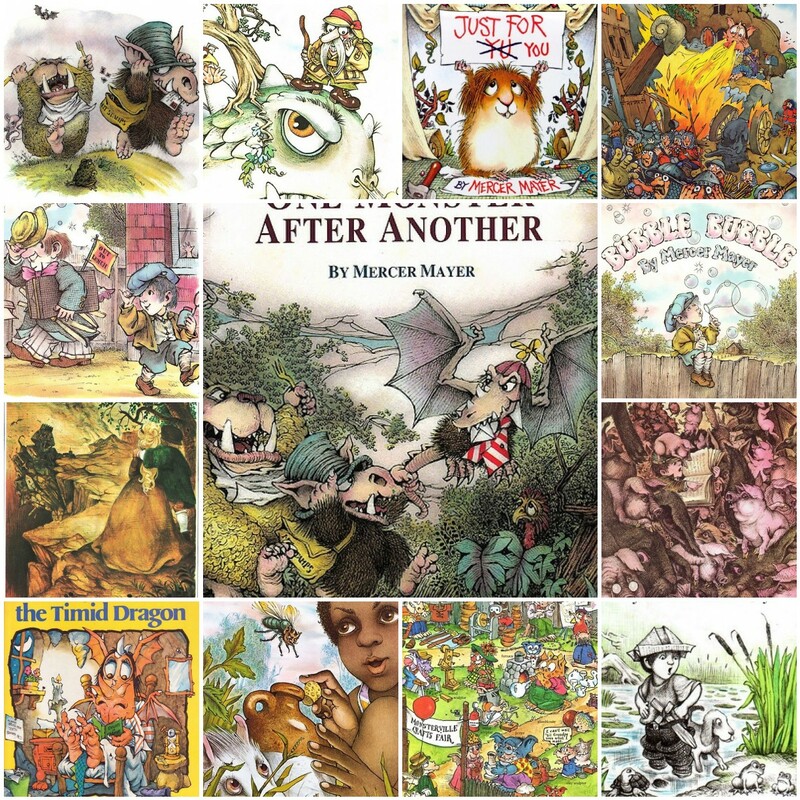 I asked Mercer about the comparisons that have been drawn between his work and that of Maurice Sendak. "Soon after Nightmare came out, a reviewer named James Woods accused it of being a ripoff of Where the Wild Things Are," remembers Mayer. "He hated it, and did a two page spread tearing it apart. I had not seen Where the Wild Things Are at the time when I drew There's a Nightmare in My Closet. It never even occurred to me that there were similarities. That story was my story. I was the kid. Both Sendak and I wrote about little boys because were were boys. I'm sure we were influenced by the same classical artists and schooled in the same pen and ink, etching style. We all were, back then." 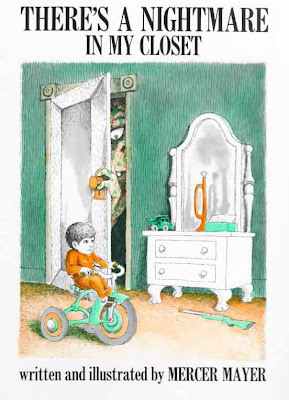 Of course, all Mr. Woods review did was help to sell the book, and the classic story of a boy and the creepy thing in his closet has been in print ever since. Out of the swamp -- and those first few expressive titles -- grew a career that has spanned hundreds of books and more than 40 years. Interview continued, here. This is so cool....YOU GOT TO CHAT WITH MERCER MAYER! Are you flying around the house on a mega-Mercer cloud?? Oh did I ever tell you that I got the new re-issue of "Zipparump-a-zoo" and it's great! I couldn't swing the price of original sadly, and the new one is smaller in scale , but the pix are all super vivid and Julia loved it. Amazing. He was such an influential part of my childhood and I especially loved One Monster After Another and the Zipparump-a-zoo books. Luckily, I had a father who saved them all for me so I still have those copies as an adult. I found joy in the intricate details of his illustrations and that the story did not just exist in the words, but also, little stories were unfolding in the pictures. Thanks so much for this piece. You are so lucky! Talking with mercer Mayer- WOW! I'm loving this- I really truly can't think of another author/illustrator that I would rather have a chance to meet. It's so much fun to read about him! Thank you!!! agreed! his illustrations are some of my first memories of children's books. love his style. smiles!